We love Maison Lejaby bras. We do it and we can’t help it. This French lingerie brand has been with us for a couple of years and, we have to admit, it just gets better and better every season. While at the beginning our stock of Maison Lejaby lingerie was mainly essential styles in a range of colours and sizes, in the last seasons, we have started to stock the most beautiful lingerie fashion styles. Not only we have more sizes, but also a lovely colour selection, including some unexpected colours. So, here you have the definitive proof of why we love Maison Lejaby bras… and shy you should love them, too! Because this Maison Lejaby bra has the loveliest orange colour! Have you ever worn an orange bra? Or rather… have you ever seen such a gorgeous orange colour in lingerie? Generally speaking, orange lingerie tends to be either a peachy orange colour or a neon orange. You may or may not know it, but bright colours are a huge trend in fashion at the moment, so this orange embroidered bra is right on trend. You can choose between a thong brief or a regular brief to match this full cup bra, which, we have to say, fits like a second skin. Perfect summer lingerie style! Yes, Maison Lejaby also knows how to make the cutest pastel tone bras. Take this bra above as an example. It’s a fine tulle fabric with lace details and it’s oh-so-beautiful! It also feels super comfortable and luxurious, like every other design in Maison Lejaby bra collection. As usual in French lingerie manufacturers, sizing is consistent and true to size. And even the most basic bra styles are pretty! 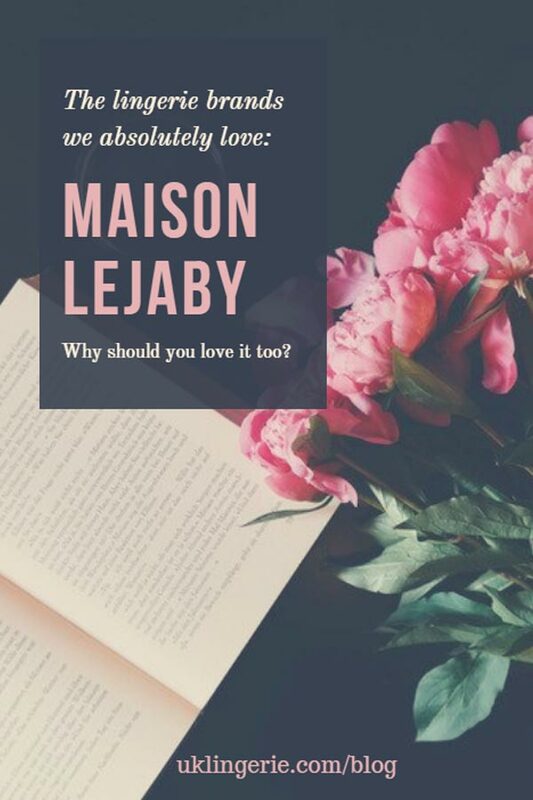 Maison Lejaby fashion styles are amazing, right? However, some of its essentials styles, available all year round, are as gorgeous and sophisticated as its fashion items. Take the example of the Maison Lejaby Gaby range. You have a wide range of bras, from push-ups, full cup, soft-cup, padded, bralettes (like the one in the picture above)… as well as matching briefs of all types: thong, bikini, maxi, shorties, high-waisted, etc. Don’t you love Maison Lejaby bras as much as we do already? Take a look at all our Maison Lejaby lingerie collection and let us know what are your favourite styles!